The Jahra Road development ... significant progress. 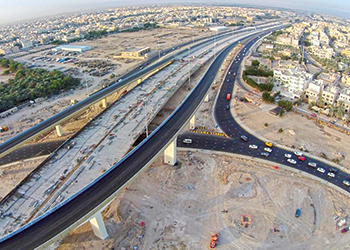 The Jahra Road Development Project in Kuwait City has marked key milestones under its various phases of construction, according to the country’s Ministry of Public Works. It said the main stretch of highway which forms part of Phase Two, extending from the UN Roundabout to the Public Authority for Applied Education and Training facilities, has been completed. In addition, the Hospital Road mainline has also been completed, along with the bridges connecting Jahra Road and Hospital Road viaducts. Currently, finishing works are under way to ensure partial opening of the main highway within the next few months. The project, which entails an upgrade of the existing Jahra Road, is located in the industrial area of Shuwaikh – one of the busiest areas of Kuwait and home to educational institutions, hospitals, industries, offices and the Shuwaikh Port. Construction work on the project has recently been fast-tracked, the ministry said. To date, 87 per cent of the piles have been constructed along with 79 per cent of the piers, and 61 per cent of the diaphragms. The precast yard has also seen great progress with 79 per cent of the bridge segments completed, and 61 per cent already erected. This mega project is set to be one of the largest elevated road developments in the world, involving the construction of 17.7 km of segmental viaducts (7.3 km of mainline Jahra Road, 2.4 km of link roads and 8 km of ramps), 0.62 km of underpass, two interchanges and 10 pedestrian bridges.